Mayor Angel Taveras, the Providence Department of Planning and Development, the Providence Bicycle and Pedestrian Advisory Commission, and consultants VHB, Inc. are working to expand the bicycle network in Providence. Please join us at the Providence Foundation on December 13th to provide your input. Update of current Bike Network Phase I routes since 2006 implementation. On-going projects for improvements to the bike network. Outline of new bikeway design Standards & Guidelines – New Tools. Identification of network gaps and network deficiencies. Coordination with proposed City roadway resurfacing program. Initial list of Phase II Bike Network improvements. Rollout of project website and bike routing tracking smart phone app. Opportunities for Education and Encouragement initiatives. Thanks, Jef. Is there currently or is there a plan to produce a similar website for the pedestrian aspect of the Bicycle and Pedestrian Advisory Committee? This is actually an initiative the City started prior to the creation of the Bicycle and Pedestrian Advisory Commission. The Commission did get to review some of the documents in draft form at our last meeting, and will be attending the workshop informally, and will be monitoring the process of the plan. There is no current plan for such a comprehensive pedestrian analysis, the City would need to identify funding for consultants and engineers, it is however something that should probably be pursued. The traffic stress map sure does describe the problem: You Can’t Get There From Here. 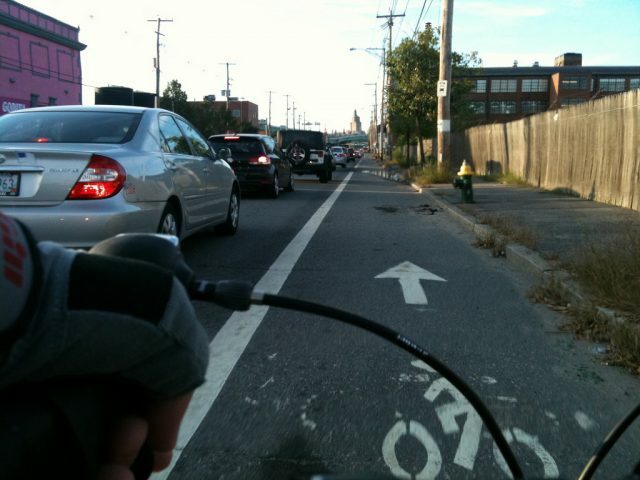 When the pinnacle of Providence bicycle infrastructure, the wonderful Allens Avenue bike lane is rated stressful, you know you have a problem. A: It did not add to the city’s bill for consulting services. B: Everyone admits that it can tell us absolutely nothing about the attitudes or behavior of the people most pertinent to the goal at hand: Those who might consider getting around by bike (or letting their children do so) but presently do not.